We know what Docker is: a container engine. And we know containers are a super-lightweight, self-contained, and portable way to run apps. And we know we tell Docker what to do with a dockerfile. Notice I didn't write "building our app." Although you can run a compiler--and thus a build step--inside a container, it's not really a normal approach. As I said earlier, the usual workflow is to automate the build and release cycle on a dedicated build server (a key part of CI/CD). The "build" we're doing here is building an image of our app that can run inside a Docker container. 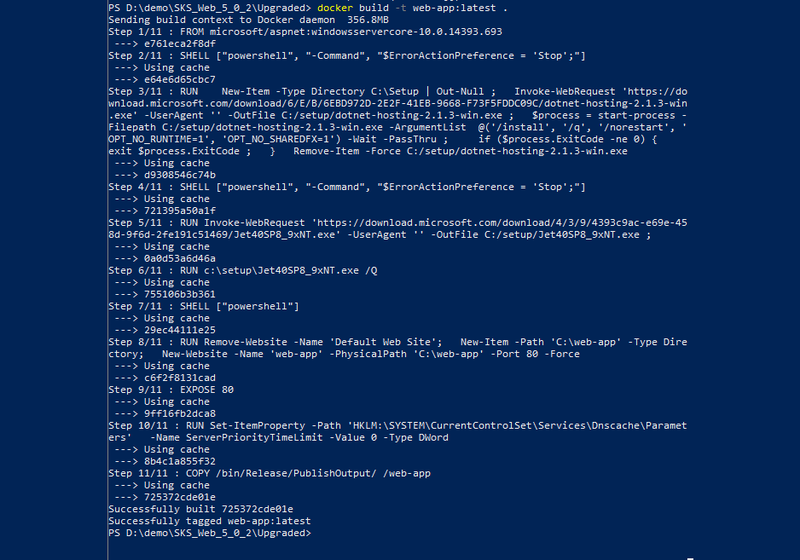 Docker has a command line interface (CLI) available from PowerShell. Once you've ensured that Docker for Windows is actually running (check the system tray), you can start a PS session and start typing Docker commands. You can always type Docker --help and get a list of all the available commands, and for each command you can get a little more detailed help, like with Docker build --help to get help on the build command. But for more indepth information you'll have to go to the official documentation, or get a copy of Elton Stoneman's excellent book Docker on Windows: From 101 to production with Docker on Windows, available from the publisher or Amazon.com. Each build fetches the base images you have specified in the dockerfile, and if necessary unpacks and runs installers specified in the base image. A Docker image is typically about 10GB, so you can spend quite a bit of time downloading the initial parts for your first build. However, when you have gone through that once you can modify your build options and even your dockerfile without having to download the same pieces again. Of course, if you change your base image, you may find yourself waiting for large downloads all over again. docker build -t web-app:latest . The -t switch tells Docker that we want to use a name for this image, basically a name for the image we can refer to. The format is name:tag, where the tag is optional. In this case the image name (tag) is web-app, although it could be anything we want it to be. The :latest tag is optional and used to clarify which version of the app is in the container (consider things like "stable," "nightly," or "bug-infested.") Finally, the "." at the end tells Docker to use the current directory as the context for the image. When we run the build command, Docker processes all the steps in the dockerfile, starting with the FROM and ending with the COPY. As you'll see from the output, it lets you know how the progress is going. This build was fast, but the first time it was slow, because downloading and installing the windowsservercore image takes awhile. Take a nap, practice juggling, or just do something else. It will be a minute. If the build doesn't work, check the steps to see where it failed, then go fix your dockerfile and try again. Notice the first line--this is the image we just built. Ignore the rest--they are other images I have created in the past. Notice that each one is about 10GB of disk space--they will stick around on your hard drive until you remove them with the docker system prune command or the docker rmi [image] command. Hmm, that was kind of anticlimatic. The relevant parts of the command are the -d switch (which says to run the container in the background and print out the container ID) and the image name (7253). If you look at the screenshot from the docker images command, above, you'll see the image ID is 725372cde01e. We can usually get docker to act on an image by specifying just enough of that value to be unique. In this case "72" threw an error, but "7253" was enough to let Docker know what image I wanted to run. Go figure. Notice under State that Running is "false" and "status" is "exited." Last night I shut down the container with a docker stop command. Ok, it works. 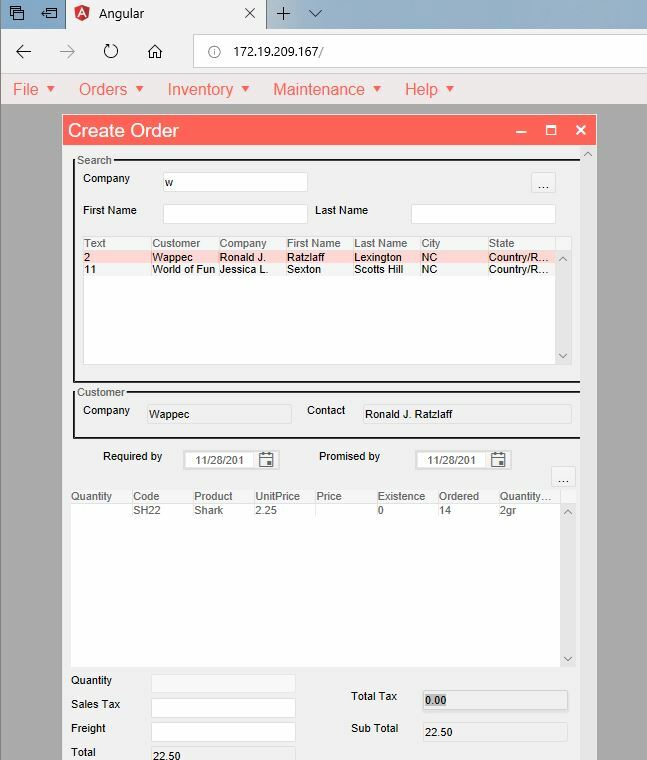 Here's our Salmon King Seafood order form running as a web app in localhost, talking to the IP address of our container. Next: let's get it working on Azure.